September 30 update: This position has been filed. Stay tuned for more details. After two years of service as editor of the Burleith Bell editor, Stacy Bernard Davis is looking for someone to take the reins, effective with the October issue. This is a great way to get involved with our community and contribute to the neighborhood's awareness of BCA activities and issues affecting Burleith. The editor is responsible for compiling and editing 4 issues per year (March, June, October, and December), working with the graphic designer on cover design and layout, and coordinating with the advertising and circulation managers and the webmaster. Issues are usually about 8 or 10 pages long, with some standard columns, like the president’s message and membership list. 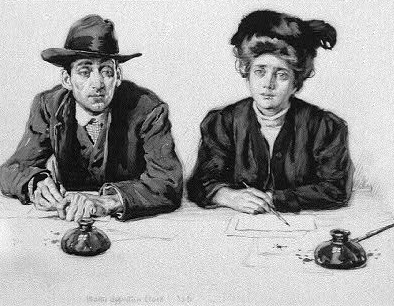 Situation Wanted, detail of drawing by Walter Appleton Clark, [1906? ], Library of Congress, https://www.loc.gov/item/2010715463/. If you’d like more information, please email bell@burleith.org. Work on the October issue would begin mid-September.